Millie Tucker allowed herself a brisk check for glitches as she paused in front of the small hall mirror. Escaped nasal hair would, after all, be an avoidable own goal. The eyebrows could do with a tint, which was depressing. She smiled. This was a new habit. And would need practice. I’ve always loved Helen Lederer ever since I first saw her back in the 80s, being a funny woman on television when it was difficult to be a funny woman on television. So I was really looking forward to reading her debut novel, ‘Losing It’. 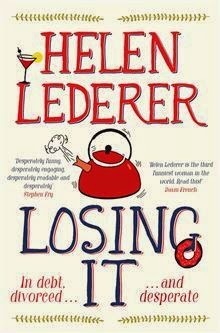 Lederer writes like she speaks and her writing is, of course, very funny. Millie, the main character whose head and thoughts we inhabit, is self-obsessed, bubbling with anger and simmering with frustration. Millie is on a quest for thinness firmly believing it will solve all her problems but she faces a constant struggle with hunger, of all kinds. This is a story of self-obsession and self-hatred, turned on its head by the love of family and friends and an acceptance of who we are and how we look. I feel this novel would have benefited from some heavier editing, particularly in the earlier stages. The stream-of-consciousness was hard to penetrate at first and it was difficult to fully engage with Millie, but she did grow on me as the story progressed and I began to feel more empathy towards her. The novel would lend itself to the stage or television as there are so many excellent scenes and lots of quick-fire dialogue. And it’s funny. Such a lovely change to read a comic novel. There are not nearly enough of these published and I am immensely thankful to Lederer for achieving this. There are some brilliantly witty lines – the funniest are usually the throw-away thoughts of Millie. It is a very well-observed comedy of manners with a quirky collection of odd neighbours and colleagues, Feng Shui, personal trainers, yummy mummies, gin and a quasi-terrorist organisation known as VPL. Bridget Jones for the older woman. After all, fifty (and in fact sixty plus) is the new thirty, right?